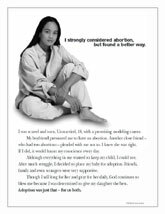 Life Issues Institute offers a free ad slick that emphasizes the blessings of adoption. Download the PDF or, if you prefer to receive a copy by snail mail, simply email us. Eileen Tucker Cosby and her husband, David, have adopted two children. Eileen is the author of a great book called “A” is for Adopted, a wonderful, gentle way to introduce the concept of adoption to children. Order here. For a list of recommended adoption agencies and other information, please visit the National Council for Adoption. Founded by Steven Curtis Chapman and his wife Mary Beth, this nonprofit organization is helping to make a difference for the millions of orphans and waiting children around the world.his wife, Mary Beth, are working with others to make adoption a blessing to more families. Alexander the Great – King of Macedonia, 356-323 B.C. Louis Gossett, Jr – actor.